This art [astronomy] which is as it were the head of all the liberal arts and the one most worthy of a free man leans upon nearly all the other branches of mathematics. Arithmetic, geometry, optics, geodesy, mechanics, and whatever others, all offer themselves in its service. Nicolaus Copernicus, Introduction to De Revoluntionibus, 1543. 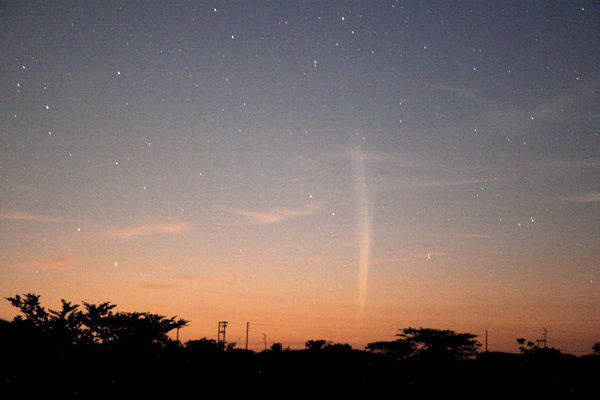 Comet Lovejoy came into view on Dec. 14 as a bright, white streak, skimmed across the Sun’s edge about 140,000 km above the surface late Dec. 15 and early Dec. 16, 2011, furiously brightening and vaporizing as it approached the Sun. It exited our field of view on Dec. 18. 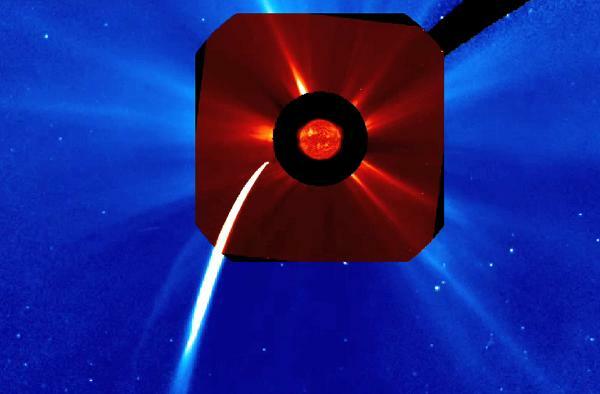 It was the brightest sun-grazing comet that SOHO had ever seen, with a nucleus about twice as wide as a football field. It unexpectedly survived the pass and cruised out from behind the Sun some hours later. Comets are ancient balls of dust and ice. In the image below, we combine views from SOHO’s two different coronagraphs (which block out the Sun) with solar Dynamics Observatory’s view of the Sun itself. Note how the tail of the comet always turns away from the Sun due to the forces of the solar wind. On the way from Madagascar to Durban, aboard of an ocean cruise liner Melody, I decided that a challenge of photographing the Comet C/2011 W3 (Lovejoy) from this huge ship would be an interesting new sub-category in astro-photography. They do it through the porthole of the International Space Station, why not to try the ship? Of course, the ISS is very stable, but moving very fast, unlike the ship, which is very unstable and moving very slowly. So, the challenges are clearly very different. The tests from a top deck of the ship have shown very interesting results. The star trails were amazing! Every new image showed a completely unique pattern and I am still not sure, which images I like more - the comet or the star trails. I think, the "Star trails from a moving ship" deserves to have it's own category in astro-photography and a special page will be created on this website shortly. Next time you are on the ship, try it! But be worned: It's addictive. Having a large rectangular porthole which provided me with a magnificent view of the Southern Cross and it's vast neighbourhood, was just wat I needed. So, the following three nights were the biggest fun in astro-photography I've ever had! 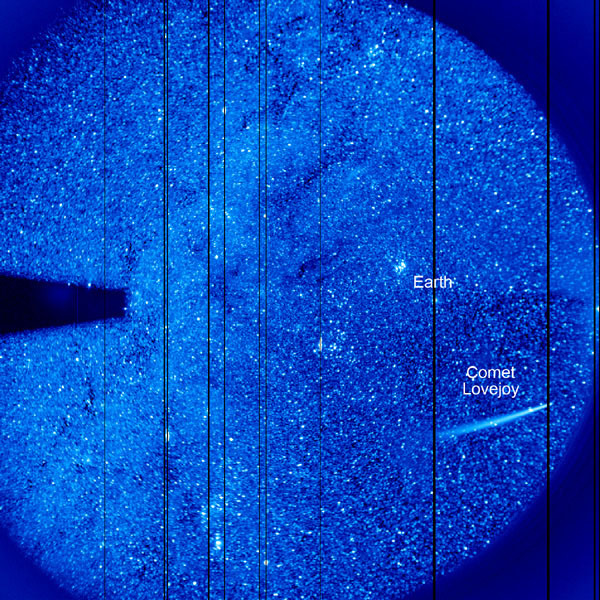 Below are the images of the Comet C/2011 W3 (Lovejoy) obtained from a moving ship during early mornings of 01, 02, 03 January 2012. Below is the star chart, plotted by "The Sky". Approximate position of the Comet C/2011 W3 (Lovejoy) is shown for the interval between 25 December 2011 and 09 January 2012, as seen from central regions of South Africa. Click on the image to open full size chart (350 kB). 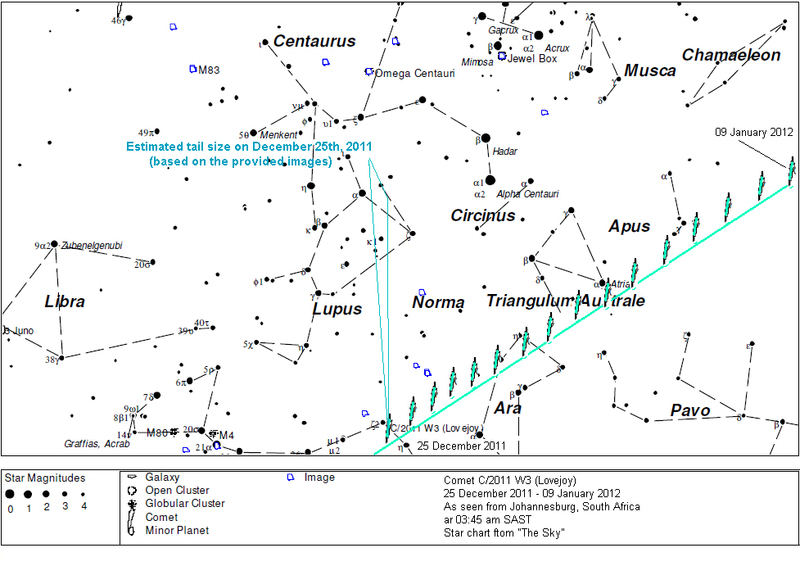 On January 09 and 10 the comet will be passing near Southern Celestial Pole. Scroll down for the latest images. 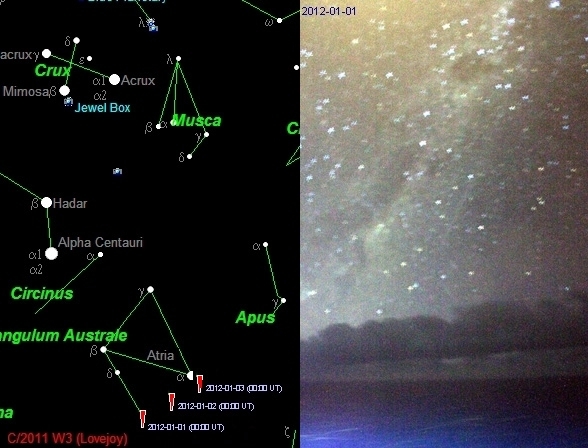 Since Comet Lovejoy survived its remarkable, slingshot journey around the Sun (most notably on Dec. 15-16), it has regained a long tail (pointing away from the Sun) and was and is still visible to NASA’s STEREO (Ahead) wide-angle imager (Dec. 17-29, 2011). 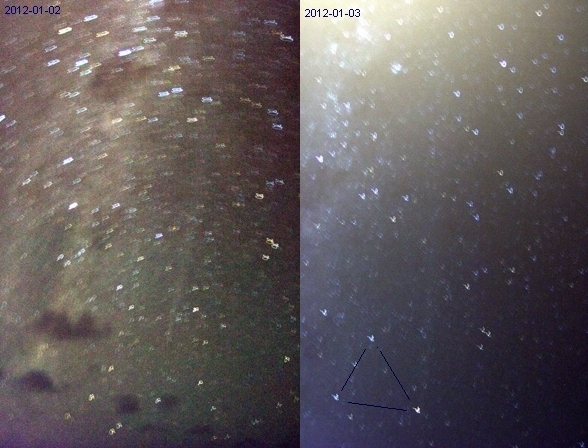 Several faint particle clouds can be seen blowing way from the Sun as well. 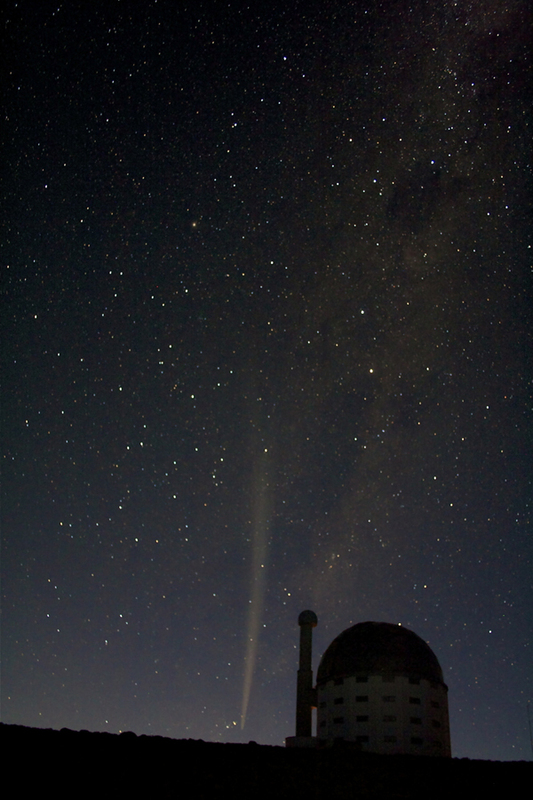 Willie Koorts (SAAO) shares with us his image of the Comet C/2011 W3 (Lovejoy). "After the nice view we had the previous day (24th), we were hoping for a better view this morning by getting up earlier but threatening cloud was a worry. We (Johan le Roux and myself) planned our shot and found a nice location anyway and set our alarms for 02h45 this morning (Christmas morning). The weather looked awful and I was about to give up, but Johan urged we should still go to the Strandveld Museum in Franskraal. 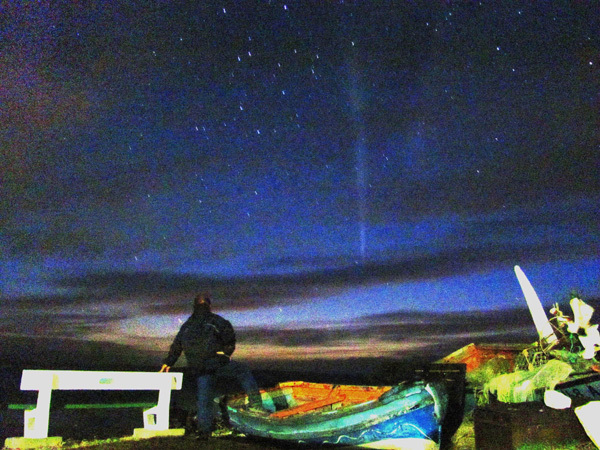 It was just as well since we had occasional gaps in the cloud, good enough to see the comet which faded noticeably since the previous day. We even had ISS flyby but the comet was clouded out at that time. Below is this morning image from Franskraal." What a wonderful visitor we are having this festive season! Now, would someone please send us an image of the comet Lovejoy, rising behind the Christmas Tree! Guess what nickname the comet will get..
OT: Compare the tail lengths in Dieter image and in Simon's image of December 23: it just isn't getting any shorter. In fact it appears longer, but the dust tail looks now closer to the Ion tail. Is that right? Below is an image from the observing plateau at the SAAO near Sutherland, kindly sent to us by Simon Fishley, observatory staff member. Simon writes: "I was hard pressed to get this shot as the wind was howling, the temp was 7C, there was a large bank of cloud rolling in from the right of the frame and I left my remote trigger in my room. I was only able to get a few shots before I was clouded out thus I did not have time to tweak exposure times, ISO etc., thus it's quite a noisy image. Nevertheless I am well pleased with the result. Structure in the foreground is the 1.9m Radcliffe Telescope." 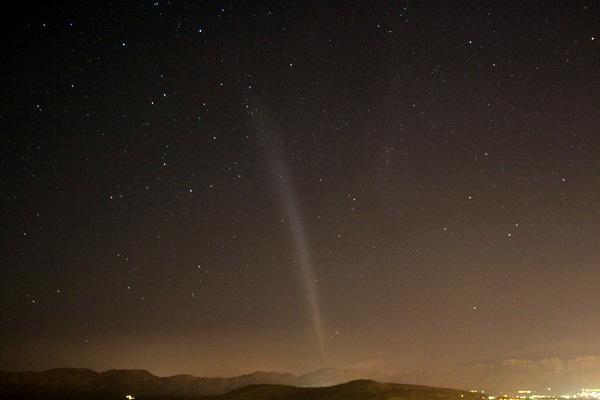 OT: What is nice about this image, is the fact, that it shows the comet in full size. It is important to get the maximum of your equipment in case like this. 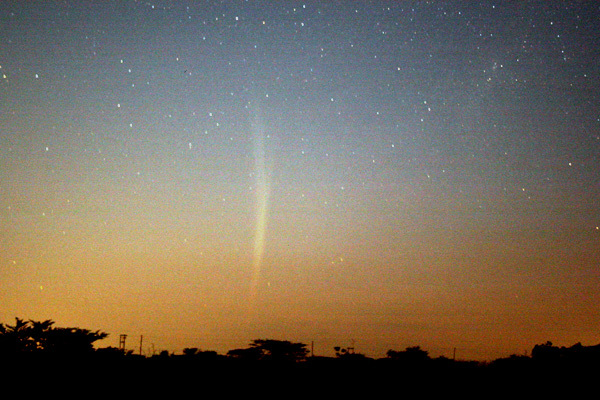 It might be not the most beautiful picture of the comet Lovejoy, but it clearly shows the comet's dust tail, stretching for 20 degrees, ending in the center of constellation Lupus, Ion tail, constellation Triangulum Australe and even one of the "pointers"-star Alpha Centauri (upper right portion of the image). After several cloudy mornings in Johannesburg, I finally have seen the Moon at about 3:45 am trough the window and rushed to the observatory. Of course the clouds were exactly where the comet would appear, so I had to wait until 4:15, when I took the fist shot of the Comet Lovejoy. Obviously, it came out exactly where it was supposed to be this morning- just behind the tallest tree on the street. Two days ago it would rise just on the left of the same tree. So, have I seen the comet? 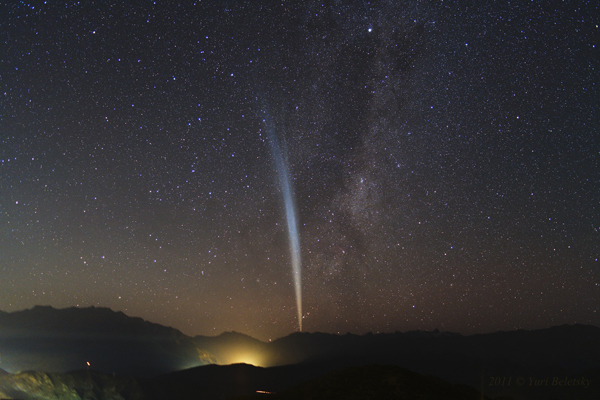 No, but I have seen two tails: one of the comet and another one of the Scorpius. After examining and measuring the images, I've come to the conclusion, that the comet's tail extends from the East to the West for approximately 11 degrees! This means, that one must use 80 to 100 mm lens with DSLR to be able to fit the visible tail completely in portrait orientation. Up in the North of South Africa, in Louis Trichardt , Kos Coronaious continues enjoying somewhat better seeing conditions and sends few more images from this morning. Following his observations a day before, Kos notes, that Comet is still a naked eye object but has dimmed considerably. I have slightly increased the image contrast in Photoshop to improve visibility of the Ion tail. If two images are compared , it becomes clear, that I have captured only the brightest part of the tail, just before it splits into two. Well, I could have seen three tails. Long-awaited images of the comet C/2011 W3 (Lovejoy) have arrived! While in Johannesburg we are still having every early morning in clouds, Kos Coronaios enjoyed his moment up in Limpopo. 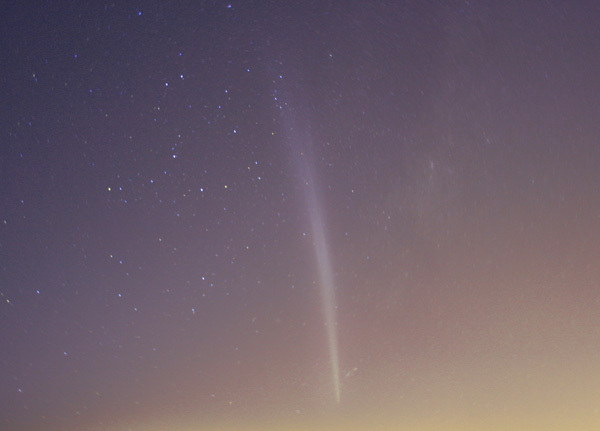 The comet has developed large tail, it's structure can be clearly seen in the images: the bright tail on the left is the dust tail and the dimmer portion on the right is the Ion tail. .. Hope you had the lovely view I had at 4 am, what a joy. The Moon, Saturn and Spica were joined by comet Lovejoy with Mercury joining the party a little later . WOW! Copyright(C) 2008-2012. All rights reserved by FOTON Optoelectronics. Unless otherwise indicated, the logos, images and text contained within the pages of this site are the property of FOTON Optoelectronics and may not be used without permission. Comet Lovejoy skimmed across the Sun’s edge about 140,000 km above the surface late Dec. 15, 2011, furiously vaporizing as it approaches the stellar surface Continue..
Buy online Celestron, TAL, INTES Telescopes, Imaging Equipment, Accessories and much more!